Below are Leaving Cert Art History exam questions, together with the marking schemes for each question. This information has been compiled from the State Examinations website. It can be argued that the most impressive early tombs in Ireland were passage graves. Discuss this statement with reference to one named passage grave and two other types of named tombs from either the Mesolithic or Neolithic periods. In your answer describe and discuss their structure, decoration, and location. Briefly discuss what you know about the people who built these tombs and their spiritual beliefs. Illustrate your answer. 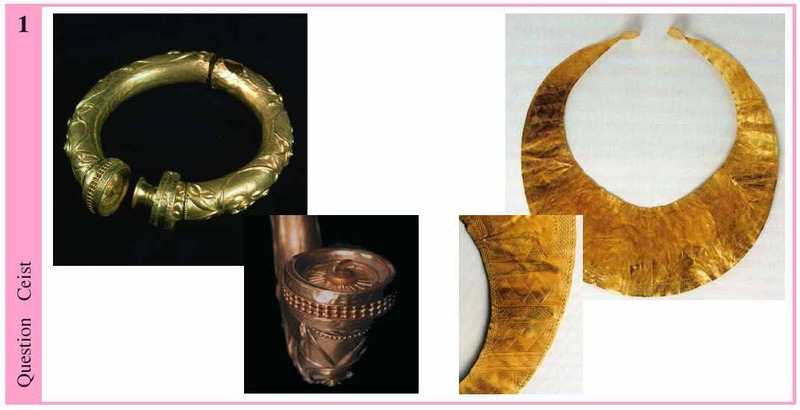 Gold-working techniques developed during the Bronze Age in Ireland allowed for the production of beautifully crafted artefacts. Discuss this statement with reference to the two examples illustrated on the accompanying sheet. In your answer name both types of artefact and refer to form, function, and the techniques used in their production and decoration. and Briefly discuss what you know about the Bronze Age people in Ireland. Illustrate your answer. The arrival of the Celts in Ireland gave rise to a distinctive style of decoration used in stone carving and metalwork. Answer (a), (b) and (c). (a) Name and briefly discuss this style. (b) Name, describe and discuss the object illustrated on the accompanying sheet, referring to form, function, materials, decoration and the techniques used in its production. (c) Name and briefly describe one other example of stone carving or metalwork from this period. Describe and discuss the development of stone carving in Ireland from the Megalithic Period to the Iron Age. In your answer include detailed reference to named examples and to form, decoration and the techniques used in their production. and Discuss briefly the function of the examples you have chosen. 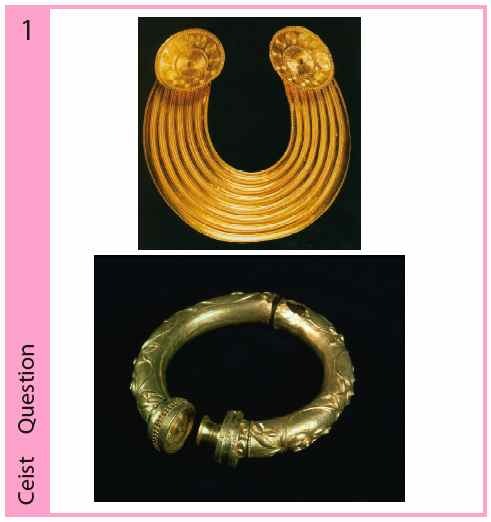 The two pieces of neck jewellery illustrated on the accompanying sheet are examples of pre-Christian metalwork. Name, describe and discuss both examples referring to the period in which they were made, materials, form, decoration and the techniques used in their production. and Discuss briefly the influence of the La Tène style on later Irish art of the early Christian period. Illustrate your answer. The construction techniques used in pre-Christian burial sites show some similarities with those of early Christian architecture. Discuss this statement with detailed reference to similarities in materials and techniques between one named pre-Christian example and one named early Christian example. and Discuss briefly the different functions of the examples you have chosen. Illustrate your answer. Name, describe and discuss the two objects which are illustrated on the accompanying sheet, referring to their form, function, materials, decoration and the techniques used in their production. and Discuss briefly the periods in which they were made. Illustrate your answer. This is really good! Any chance you would write in sample answers?